Intempo InSession review | What Hi-Fi? 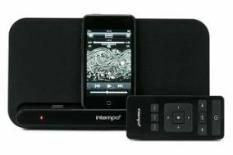 Compared with the unusual Edifier iF500 iPod system, the Intempo InSession looks remarkably sedate. Well, what do you expect from a product that costs half the price? The Intempo uses two, 25W speakers and a rear-firing 9W sub for a bigger bass presence. On the front there's a protruding platform on which to park an iPod (apart from the Shuffle). You can charge your iPod through the dock and use the USB input to transfer music from a PC or Mac. There's no built-in rechargeable battery with the unit. A small remote allows full control over your iPod, including bass and treble, but even a whole week's worth of tweaking would prove pointless. Yes, the Intempo produces a weighty sound, but this only encourages the plastic cabinet to vibrate uncontrollably, leading to a colouration of the sound and a loss of clarity and detail. Lupe Fiasco's vocals on Superstar sound closed-in and the accompanying instruments appear messy and misplaced. Even if your budget is limited to £80, there are better alternatives.